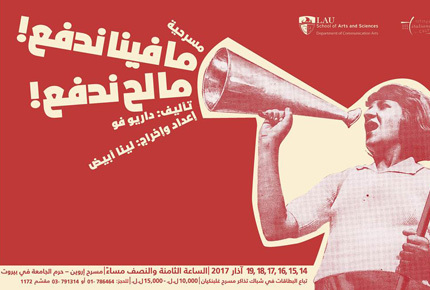 LAU | Events | Major Theatre Production: Can’t Pay! Won’t Pay! Major Theatre Production: Can’t Pay! Won’t Pay! Inflation has reached an all-time high. Frustration breaks the tension as Antoinette leads a revolt at the local supermarket, and looting guts the building. Antoinette, and her friend, Rita, try desperately to hide their ‘liberated’ goods before their husbands and the police catch up with them. Beneath the surface of this energetic social farce, Dario FO addresses serious issues which are extremely relevant to the Lebanese audience. In a world which believes that eating and housing are not a privilege, more and more individuals in Lebanon are not able to afford decent food and housing. The job shortage and the low wages are really pushing people to immigrate.